On April 4, 2015, Walter Scott, an African-American resident of South Carolina, was stopped for having a broken tail light. He was stopped by Officer Michael Slager, a White, North Charleston police officer. A few minutes later Scott was shot several times in the back while trying to flee. The incident was presented as a justifiable use of force by authorities until a videotape surfaced Slager calmly aiming his service weapon and firing into the back of Mr. Scott as he was running away. It was national news. Stories of people killed by local police action rarely get national attention. Unless there is some dramatic twist or shocking video, the incidents are only reported in hyper-local community newspapers. The only sources for these reports are usually a police spokespersons and sometimes friends or grieving family members. When cases like the Scott shooting do capture regional or national attention they also raise significant, unanswered questions. Just how many citizens are killed in police actions in this country? Is this rare? Who is keeping track of the numbers? Does this sort of thing happen mostly in certain areas or departments? Is it just a few bad apples or are there larger patterns? Almost two years ago a group of dedicated citizens began searching through local newspaper accounts of police involved civilian deaths throughout the country. They started a Website called KilledByPolice.net. They compile names of civilian casualties and added links to the initial news accounts. They also open a Facebook page on each person killed to post follow-up news accounts and to collect any local comments about these cases. Most of these fatalities are police homicides, justified or otherwise, but the data also includes murder/suicides by police officers, fatal DWI accident where the officers were intoxicated, police assisted suicides of mentally ill persons and other such categories. This effort turns out to be the most comprehensive data resource I’ve seen so far on police action fatalities. Based on this raw material I have begun my own analysis of the data. Here is a brief summary of my initial findings to date. Between May 1, 2013 and April 4th, 2015 there were 2,181 people killed by police officers in the United States. That works out to around 95 per month or 3 police action fatalities per day. There is clearly a gender bias in police action fatalities. Almost all are males, 2,044, with only 135 females killed in this 23 month period. In six other case the gender was undisclosed. The full identity of 565 fatality victims were not disclosed to the media as of yet. The average age of the known fatality victims is 36.9 years, which is also the national median age of the population. This means that there is no age bias in police action fatality. Younger people are not more likely to be killed in a police action, for example. Regarding race and ethnicity, Latino’s make up 18.7% of the general population and were 17% of the fatality victims during the past 23 months, suggesting their rate of police involved fatalities is proportional on a national scale. This may not be uniformly true in every locality. Whites make up 77% of the population but only 48.1% of the victims. African-Americans make up just 13.2% of the general population but 30.5% of the total fatalities. This clearly suggests a racial bias in police action fatalities. When the data was sorted by U.S. Census regions, 41.5% of all police action fatalities took place in the Southern states. Add California’s 730 incidents to the Southern total and the subsequent total account for 58.4% of all cases nationwide. 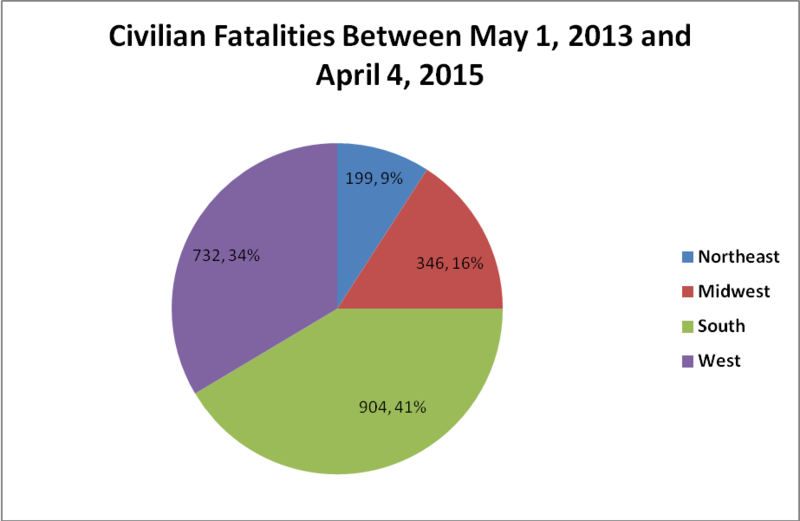 In contrast, police action fatalities in the highly populated Northeast make up 9% of the total. (see pie chart) The large regional differences strongly suggest that these incidents are not the random acts of a few bad apples, as some suggest, but real differences in police training, policy and culture. The states with the highest rate of police action fatalities, in descending order, are Alabama, Wisconsin, Washington State, Arizona, Oklahoma and New Mexico. Wyoming, Vermont and Idaho have the lowest rates. The states with the highest annual average of civilian fatalities are California (193), Texas (112), Florida (93), Arizona (50) and Illinois (33). The data contained in the KilledByPolice Website is far more extensive since in contains reports of the police accounts and some follow-up articles, but this information is not yet in a form that allows for statistical analysis. It seems that most of the reports I reviewed so far involve police shootings, but this remains to be verified. Defenders of law enforcement will say, with some justification, that the vast majority of police officers are honorable, law abiding and competent professionals who put their lives on the line to serve and protect the public. This is a true statement. As a whole the incidents of police action fatalities involves a tiny fraction of the overall mortality rate and it is sure to be a tiny fraction of all incidents of police engagement as well. This, however, is not a high standard to judge whether the current rate of fatal outcomes is significant. To help put these numbers a national context, there were only 70 civilians killed by the police in Great Britain in the last 90 years. The better standard to judge the significance of this problem is to ask how many of these civilian casualties could we have avoided. Even when a police shooting is ruled a justifiable homicide, for example, different tactics and better training might still have avoided a fatal confrontation. The justifiable use of deadly force is predicated on existing policies, procedures, tactical training, departmental culture and the careful vetting of law enforcement personnel, to list just a few factors. It is our obligation police action casualties and protect the life and safety of every citizen, including those who are subject of police actions. The problem is very real and it deserves public attention.